Blogging Belmont reports on the intimidation campaign against one of this year's candidates for selectman. That's a lot of turkeys John Nolan watched cross a bridge in Belmont today. The company behind Craft Beer Cellar outlets is making a federal case out of negative reviews on Glassdoor.com, a site that lets people review the companies they work for. Read more. 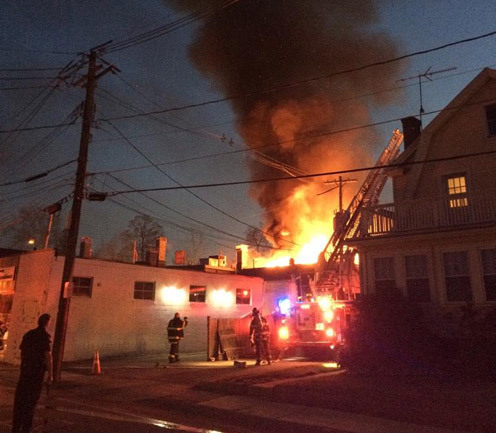 Jiaan Hyland watched firefighters from Belmont, Cambridge and Watertown battle what turned into a three-alarm fire tonight at 52 Grove St.
Joe Morrissey reports the fire started in the basement. There's probably a good reason why the pedestrian bridge over Rte. 2 at the Arlington/Belmont line is packed with all the old Christmas trees that David Weininger spotted this morning. 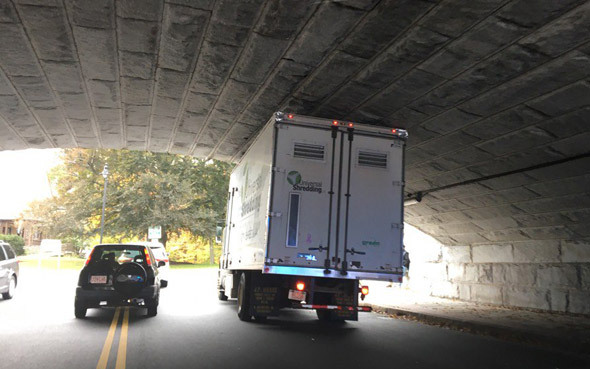 Nasty Tasha came across a truck that almost made it out of the tunnel in Belmont Center, but instead wound up nice and storrowed early this afternoon. BPD&BFD respond to car on a pole at Hittinger st. No injuries. The Supreme Judicial Court today upheld a Belmont man's OUI conviction that came about due to an anonymous 911 about a swerving car on Memorial Drive by a state trooper who didn't actually see the swerving. But in upholding John DePiero's conviction for a 2011 arrest, the state's highest court broke with the US Supreme Court, which ruled in 2014 that anonymous 911 calls are inherently legitimate as tips that can lead to a traffic stop these days because false 911 calls can be tracked. The SJC ruled that, in Massachusetts at least, unless 911 callers are first informed their calls can be tracked, an anonymous caller with malice on his mind might still make that false report if he was unaware he could be tracked. Read more. 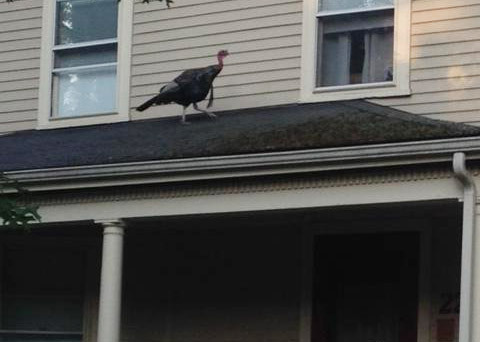 Tim shows us a member of an elite turkey shock troop headed straight for a second-floor window at his parents' home in Belmont yesterday. Who sweeps up the sweepers? 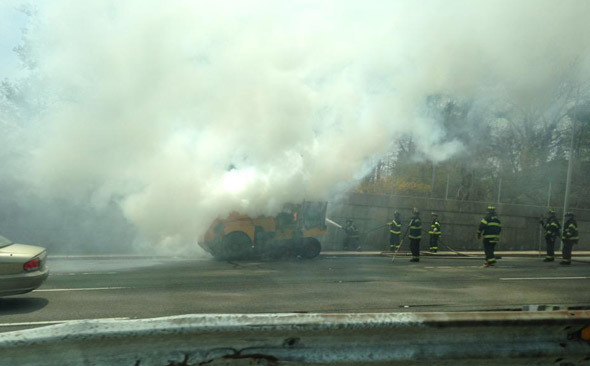 Tom Dobson passed a street sweeper on fire on Rte. 2 eastbound in Belmont around 12:20 p.m. If you're from Belmont, any of these people look familiar? 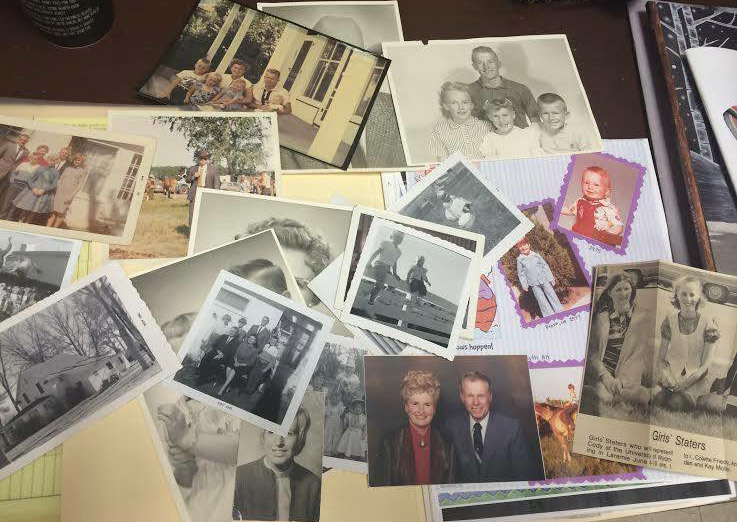 KSquared reports her sister-in-law found a folder of photos just lying on the ground on Leonard Street in Belmont a few years ago, and has been trying ever since to find out who these folks are, so she can return the photos to their owner. Colin Steele photographed a convenience store on fire around 8:10 p.m. on Belmont Street at School Street near the Watertown line. Is it curtains for Belmont's 96-year-old Studio Cinema? The Belmontonian and Wicked Local Belmont both report that town officials have closed Belmont's only movie theatre, citing code violations. The single-screen Studio Cinema on Trapelo Road has entertained Belmont residents since 1919, but owner Jim Bramante told The Belmontonian that he sees "only about a 10 percent chance" than he can make the repairs that the town is now demanding. NOTE: Headline changed to reflect the fact it was the US government, not the Chinese, that wouldn't let the family return here. A Chinese CFO who rented a house in Belmont for a year owes the landlord rent for the entire year, even though she and her family found themselves stuck in China midway through the year after the US would not grant them visas to return here after a trip there.